He’s cute, a little timid, incredibly awkward, a bit of a hopeless romantic, and yet, you can see in his eyes, a lust for life. Who am I describing? Well, three people, or characters rather. One seemingly garnished with a bowler hat and moustache, one has a Great Stone face, and one is made of metal. But all three are clever creations in their own right. It is the last character, however, that I want to discuss. WALL·E, the titular character of Disney/Pixar’s computer animated gem, is often likened to the Little Tramp, the on screen persona of silent screen legend Charlie Chaplin. But I thought, Why Chaplin? Is he not an amalgamation of two of the silver screen’s greatest silent legends? So I thought, why not explore this a little more. WALL·E, released in 2009, is the tale of a robot, or a Waste Allocation Load Lifter: Earth Class model, who is very unique: he has a personality. Unlike the rest of the automatons that were created with him, he is a fully fleshed out being, self-aware and in love with the discovery of the world, however decrepit it is, around him. His apartment, as it were, is full of trinkets; the little things he finds as he continues with his job on Earth, creating skyscraper high piles of trash that have been compacted into cubes. It’s the personality, though, that makes WALL·E one of the best characters that Pixar has ever imagined. One of the biggest accomplishments of the film is that WALL·E is as real as any human character any other film has presented on screen. His child like wonder and amiability almost make him surreal. The two scenes that stand out to establish WALL·E ‘s realness are when he looks up at the sky and you see a close up of his binocular eyes and when EVE accidentally almost destroys his videotape of Hello, Dolly! The animation is so carefully illustrated to key in every discernible emotion needed for the scene: desire, worry, fear, and, most importantly, longing. WALL·E is in, many ways, a pure wonder when it comes to on screen characters, not limited to animation, but he is often compared to Chaplin with good reason. That said, the likeness is not limited to Chaplin and may be, in fact, more of an amalgamation. Charlie Chapin made his career initially with the Keystone Kops, but it would be in 1914’s “Kid Auto Races at Venice that he would make his first appearance as the legendary Little Tramp. In 1918, with A Dog’s Life, he would not only play the Tramp, but he would be credited as Writer, Director, Producer, and Composer. His first feature would be 1921’s The Kid, but he would essentially abandon the Tramp Character after1940’s The Great Dictator, in which he appears as the Tramp in a different iteration: a Jewish Barber. Chaplin’s greatest film, though, may be his 1936 masterpiece Modern Times, a fascinating indictment of big business and the American economy. Chaplin’s Tramp was characterized by his quirky, sometimes flirtatious, always benevolent smile, his inherent clumsiness, and occasional melancholy. An underlying theme of Chaplin’s work, especially Modern Times, was that hard work and high spirits could get you through almost anything. There was a special human quality in the films of Chaplin. In Modern Times, the Tramp is fired from several jobs, but it’s his love, Paulette Goddard as the Gamine, who gives him hope. Both suffering during the Great Depression, they try to make the best of it, walking into the sunset and trying to smile. Chaplin’s comic persona was reliant on the pantomime – those funny movements that mix ballet, slapstick, dance, and athleticism. WALL·E creeps around, bounces, and floats, just as Chaplin did. In Modern Times, the Tramp does a spectacular roller skating routine in a large department store. This scene, so exemplary of Chaplin’s skills, marry Chaplin’s genius for athletic humor and his outstanding choreography. It enraptures the audience, and this scene is only comparable to when Chaplin gets sucked into a large machine and is at the mercy of the turning gears. WALL·E displays a similar ability to pantomime in certain scenes, primarily when he is alone and looking through trash. In the opening montage, the way with which he picks up the random collectibles is very reminiscent of Chaplin; he throws the things unceremoniously into a red cooler and finds himself messing around with a fire extinguisher. But the scene that best represents Chaplin’s skills in respect to WALL·E is a scene at the beginning, where Chaplin is used as a test subject for a new robotic device which helps feeds the employees as they work. In WALL·E, the little robot finds himself at the mercy of a beautician robot who paints his face all “prettily”. It’s an extremely brief scene, probably lasting no more than a few seconds, but even something as short as that seems to be an indicator that WALL·E shares many traits with the Little Tramp. However, despite the many connections that WALL·E has to Chaplin, as many can be made with the other silent screen legend, Buster Keaton. Known as the Great Stone Face and renowned for his stoic, unsmiling approach to comedy, Keaton’s films were filled with incredible stunts and as much pathos as any Chaplin film. Standing at five feet four inches, the extremely athletic Keaton began his career working with Fatty Arbuckle and eventually moved on to make his own one and two reelers. His debut feature, The Saphead from 1920, was actually not the first film to feature Keaton in a slapstick role. Instead, the film, based on Bronson Howard’s play The Henrietta, was played as more of a straight comedy. Keaton nevertheless lent himself to the little physical comedy in the film that there was. Although The High Sign was his first independent effort as a writer, director, and star, he was dissatisfied with the results and delayed it a year and released One Week as his first film instead, in 1920. His second feature to include him as chameleonic Great Stone Face would be Three Ages in 1923, a spoof and loose remake of D.W. Griffith’s epic film Intolerance, from 1916. His best film is often cited as 1927’s The General, but my personal favorite, and the film that best works in tandem with WALL·E, is his 1924 treasure Sherlock Jr., in which Keaton plays a movie projectionist who literally steps into the silver screen. Much of Keaton’s work was primarily defined by its physicality. 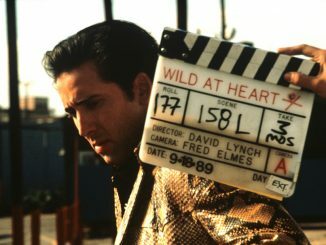 He was the king of amazing stunts, and his own ability to acquire great shots in his films while putting his life at risk, makes the films even more magical. The vaudevillian roots of Keaton can be summed up as this: his father brought him into the show when he was three, and soon enough, he brought in more money than his father did. In that way, Keaton was a born star. It is ironic that the camera loved him so when his persona seemed totally indifferent. It may be the indifference, the humble quality of each character he played, that is why audiences love him so. WALL·E is similarly indifferent about the camera and similarly the love object of the camera. Many of the “stunts” that are in WALL·E feel somewhat Keaton-esque, from the jumps, to the falls, to the jumps across bridges, to the manic way that WALL·E “runs”. 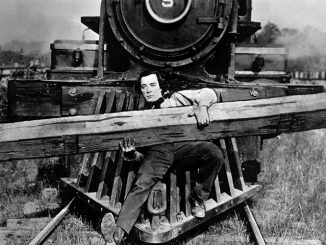 Buster Keaton’s run was pretty distinctive, as if the Devil were chasing him and he needed to get the heck out of the way. 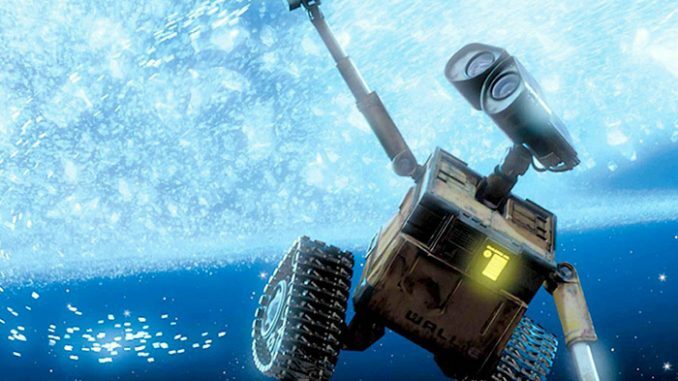 The biggest thing that WALL·E seems to have in common is the way they approach romance. You could argue that the date montage in WALL·E is closer to Chaplin’s City Lights, but I disagree. In Sherlock Jr., Keaton sits on a bench next to Kathryn McGuire, and slowly, ever so slowly, inches his hand to hers. He’s flustered when she takes it, and it’s an amusing look that Keaton gives to the audience, as if he, too, cannot believe that what has happened has indeed finally happened. In the date montage in WALL·E, scored to Louis Armstrong’s rendition of “La Vie en Rose”, the great rust bucket does the same thing, seemingly almost shot for shot. Andrew Stanton, the film’s director, throws in an extra little gag in there. As EVE is what could be considered incapacitated, the “hands” lock back to the side of EVE’s pod like body and WALL·E struggles for his hand back. Timidness is especially cute in both characters. The two approach romance in their films completely new to the idea, but nevertheless determined. Although Keaton is prone to giving up when he is defeated, he still returns to courting his love. This idealistic hopeless romanticism paired with the occasional awkwardness is crucial to understanding WALL·E as both a character and as a film, and crucial to understanding a specific dynamic in the films of Buster Keaton. He pantomimes, he approaches love awkwardly, and he gazes at life with such a beautiful lens, it’s impossible not to love him. WALL·E is a one of a kind character who, nevertheless, owes some due to Charlie Chaplin and Buster Keaton. The greatness of WALL·E is that the two personalities used to create the character offer a fully illustrated, emotionally complex, superbly rendered, and incredibly choreographed being. WALL·E isn’t trapped by the parameters of aspect ratio or screen sized; he is, like the icons that came before him and despite his small size, larger than life. Kyle Turner has had a love for the magic of film in his blood since he was five. Since then, he has created his own film blog, moviescene.wordpress.com, become a short filmmaker, composed a research essay for his high school on film noir, and written for VeryAware.com as news contributor and think piece enthusiast. He'll be covering various aspects of cinema in essays, probably from the perspective of a pretentious teenager. You can follow Kyle on Twitter at @tylekurner. This is a piece I did for The Black Maria. Hope you enjoy.